The 2001 Saskatchewan Summer Star Party (SSSP) in Cypress Hills Interprovincial Park was an event I’ll remember for the rest of my life. My wife Jennifer and I were really looking forward to a weekend under the stars with our new 20-inch Obsession telescope. We had ordered the telescope in September of 2000 and finally received the mirror in July 2001. The SSSP was going to be the first “really” dark location to test the performance of the telescope. We were also a little unsure what the weekend might hold in store for us since our daughter, Emily, was only 8 months old and not sleeping through the night yet. As every new parent knows, sleep is a major concern with a young baby. We set out from Regina on our 4-hour trip to darker skies. We checked into the hotel and proceeded to the Meadows to set up the telescope before it got dark. The telescope performed well but as with any new instrument, it takes a few months to get familiar with it. The first night of observing was very good, although there were pockets of warm air drifting through to blur the images for short periods of time. We learned our lesson with Emily since she slept as we observed. When we got back to the hotel at 4:00 am, she woke up and wanted to play. We never did get caught up on sleep for the rest of the weekend. We spent most of Friday, August 17th, taking shifts with Emily and grabbing as much sleep as we could. We arrived at the Meadows late after giving an evening presentation to the attendees of the star party. I set up the telescope in the dark and didn’t enjoy it much since my laser collimator was out of alignment and needed fixing. I used a flashlight and the film canister to do the collimation. It seemed to work all right but the images were not crisp. I tried for Pease-1 again but the atmosphere wouldn’t cooperate for a glimpse. Alan Dyer came by the telescope and stayed for about three hours. He really enjoyed observing some of the fainter objects including the Crescent Nebula. There were quite a few people around my telescope so I decided to show them Stephan’s Quintet. I started by finding the galaxy NGC 7331 in Pegasus. I got mixed up and went the wrong way only to stumble across a group of galaxies in the opposite direction from NGC 7331. Oops! Alan Dyer corrected me and I went the correct way to find Stephan’s Quintet. I was relieved since those other galaxies were quite a bit fainter that I remembered Stephan’s Quintet being. This wasn’t the first time I navigated in the wrong direction and wouldn’t be the last. Jones-1 was also an easy target for the 20-inch as were many other wonderful objects that night. Most people started packing up their telescopes around 3:30 am. I didn’t feel like it yet since Jennifer and Emily had gone back to the hotel around 2:00 am. Around 3:45 am, I tried looking for M1 for the first time with the telescope. For some reason, I started star hopping from the wrong star. I cruised around the area for a couple of minutes hoping to spot M1 while I was scanning but instead, I stumbled across a faint fuzzy object just south of β Tau. I almost passed it over since I was pretty sure it was another galaxy and not M1. M1 should have been brighter than this object, or so I thought. I went to the laptop to see if I could find out what this object was. Just at that time, Rick Huziak from the Saskatoon Centre appeared out of nowhere for the first time that night and posed the question, “What are you looking at?” I couldn’t really answer his question. I told him I thought it was a galaxy. After studying it for a couple of minutes, he figured it was probably a comet since the coma seemed to extend a long way without having a well-defined edge. My laptop didn’t show any comets in that area of the sky but my comet data was a month old. Rick suggested we sketch the field. I didn’t have a pen or paper since I was planning to do only visual observing during the star party. I figured out exactly where the object was by using β Tau as a reference. It was approximately 2 degrees away in the direction of the ecliptic. Steve Meister and Michael Plante from the Regina Centre were also there and took a look. They were the third and fourth people to see the comet. When Rick and I were sure where the comet was in the sky, Rick went to get some paper. After he came back, he sketched the field. Using my 31-mm Nagler eyepiece with a one-degree field of view at 80×, we made our observations of the comet. After Rick completed the sketch, he went back to his telescope and laptop to dig up his data for all known comets brighter than magnitude 12. I didn’t know it at the time, but his data was also nearly a month old. Rick then made various observations with his 10-inch reflector using magnifications up to 300×. He also alerted his friend, Paul Campbell from the Edmonton Centre, to the comet’s presence. Paul found the comet in his 12.5-inch reflector to confirm the observation. About 30 minutes later (around 4:45 am), Rick returned with Paul to take a look at the comet through the Obsession. We determined it had moved approximately 2′ in the eyepiece over that hour. Paul told us his story of how he had star-hopped through that region down to M1 earlier in the evening and didn’t come across the comet. He was nearly dumbstruck as he collapsed into the nearby lawn chair trying to figure out how he had missed it. We all smiled. By 5:00 am we were pretty confident with our observations and estimated the magnitude at 12.0. We later revised this to magnitude 11.0. The coma was approximately 3′ in diameter. We packed up the scopes since the sun was rising and the clouds just starting to float in. Rick and I went to the hotel lobby, where Rick wrote out the observing report on paper to get the details as accurate as possible. We calculated the comet’s position in the sky to be 5h 31.9m and +28° 8′. The comet had a bright nucleus and a coma that slowly diffused into the background darkness. No elongation of the coma or tail was detected. I looked up the phone number for the International Astronomical Union in Rick’s copy of the Observer’s Handbook. I used the pay phone in the lobby at the Cypress Hills Resort Inn to phone the first number in the handbook. There was no answer at Brian Marsden’s office. I phoned the second number, which was Dan Green’s office, and got an answering machine. I left the message we had prepared and then decided to get some sleep. I took Rick back out to the Meadows in the van and came back to the hotel. All through the night, I was feeling that someone else in the world must have found the comet already, since the new moon in August is a great time to hold star parties. Surely someone at “Starfest” would have found it a couple of hours earlier. Jennifer and Emily were already awake when I returned but Emily was just going back to sleep. I told Jennifer what had happened. We were tired and went back to sleep around 6:45 am. Emily got up again at 8:00 am. Rick came over about 3:50 am. The next morning, I checked my email and found a message from Dan Green. Apparently he had tried phoning me at our house in Regina. In his email, he asked for some information, which I promptly sent to him. I also downloaded the latest comet data from the Center for Astrophysics Web site at IAU Minor Planet Center. No matches were found in the data for our comet observation. Rick and I suspected that it could be comet Wild 4, but that was nearly 4 degrees away and shining at magnitude 19.8. Not a likely candidate, but one worth considering. We still didn’t want to get our hopes up too high. I received another email from Dan Green around suppertime on Saturday announcing that he had contacted observers in Europe and North America to look for the comet. Reading between the lines, it was pretty clear that nothing matched the observation we had submitted so things were looking up! Dan mentioned in his email that he hoped that the comet was REAL and that it was NEW. At that point, there were only two things going through my mind: can anyone find it again, and am I the only one to spot this comet? Just before Alan Dyer’s evening presentation, I made a special announcement in front of everyone gathered at the SSSP. I told them that I had perhaps found a comet the night before and that Richard Huziak and I had put in an observation report to the International Astronomical Union in Cambridge, Massachusetts. The email I received back indicated that it could potentially be a new comet. The crowd gasped and started cheering and clapping. I explained that it would be like a dream come true as I nearly broke out in tears. I invited everyone to come over and take a look if we could find it again. Thanks for the additional information, Vance. I’ve contacted several observers in Europe and North America to try and get confirmation and some accurate astrometry (if confirmed). If you get a chance to observe it tonight, please note the position as accurately as possible and the time as accurately as possible and forward that by e-mail ASAP. We’re hoping it’s new and REAL! After Alan’s excellent talk on the Milky Way, I went out to the Meadows. Jennifer stayed in the hotel to look after Emily. Later, she had wished that she had come out. I was happy she decided to get some sleep instead since the weather was not good and she didn’t miss anything. The wind was gusting and cold and I left the light shroud off so the telescope wouldn’t blow around like a weather vane. Alan Dyer came over as did many other people (about 30 or 40), and we sat and chatted about astronomy-related topics. By midnight most people went back to their telescopes to retire for the evening. The cloudy skies were looking grim in the west. Don Moreau, a friend of mine who got me back into astronomy, stayed out at the Meadows with me. About 1:30 am, an opening in the clouds appeared in the southern sky. Could the opening be coming our way? It eventually came overhead and Don went looking for a few objects through the thin clouds. I decided that I had rested enough in the chair and began to collimate the telescope in the dark with the LaserMax even though it needed fixing. We waited and the sky started to clear in the north as Auriga climbed above the trees. Unfortunately, there was one cloud blocking the view in the area of the comet, even though the whole northern sky had cleared. After what seemed like half an hour, the cloud partially moved off. I found the star field where the comet was the night before through the hazy clouds and proceeded to pan in the direction that I though the comet was moving. No luck. After about 5 minutes, I gave up and started panning all around that part of the sky. I eventually found it and yelled out to Rick that I had found it again. He came over right away, as did many of the other astronomers that were in the area. At that point, I was very happy since that confirmed the object was indeed REAL! Only one question left to answer: was it NEW? The clouds were moving in fast. Don Moreau had a look at it before Rick arrived so we started to plot its position against the star charts. After about 3 minutes, the clouds moved in. We promptly packed up the telescope as a major wind started blowing and some very dark and menacing thunderclouds came overhead. Lightning lit up the Meadows like daylight as we packed the telescope into the van in record time. The first raindrops started falling just as I closed the hatch. We heard a crash from down the Meadows as a telescope blew over. Don Moreau went back to the hotel and I stuck around to help turn things over so the wind wouldn’t blow them away. We sat at the picnic table watching the clouds fly overhead. I kept thinking about Dan Green’s comment about the object being real and that we now had confirmed it was real. I was hoping that somewhere in the world it would be clear enough to allow the professionals to find it and confirm the sighting as we had. As we sat, a small clearing behind the storm looked like it might come overhead but it headed in the wrong direction. We decided it was not worth staying up any longer hoping for one more glimpse. I hopped in the van and headed back to the hotel around 3:00 am. Emily had just finished eating and was fast asleep. I told Jennifer about the evening and that she didn’t miss much. We went to bed at 3:30 am because we were both very tired. We found the potential comet but only had a few minutes to locate its position in the sky. We couldn’t do it. The view of the comet was faint because it was so low on the horizon and a thin haze further reduced its brightness. I’m sure it would not have been visible in a 12-inch telescope because it was that faint through the hazy clouds. The nucleus could be seen and the inner coma as well. At least we had found it again so we knew it was real. Of course, we would have to wait to find out if it was new. Sunday morning I awoke and checked my email around 10:00 am. There was no word from Dan Green. Many people came up to wish me luck with the discovery as they were checking out of the hotel. Jennifer and I packed up the van and checked out at 11:00 am. We ate breakfast in the restaurant with members of the Regina Centre. After that, I thought about checking my email again but decided that it could wait. We headed out to the Meadows to take down our tent and pack the rest of our stuff. Sean Ceaser and Gail Wise from the Winnipeg Centre were there so we visited with them for quite a while. I showed them the position where the comet should be since they were staying at the Meadows for another night. John Mulvenna, from the Regina Centre, also came over for a chat while we were packing up. We took a few pictures and then left the park around 2:00 pm. Emily was very good on the way home and slept most of the way. When we arrived home, I went downstairs to check my email. The confirmation from Dan Green came in at 11:21 am so had I checked my email before heading to the Meadows, I would have known the outcome. The comet was officially named C/2001 Q2 by CBAT (Central Bureau for Astronomical Telegrams). I also had two congratulation emails from Maik Meyer in Germany and from Greg Bryant in Australia. Apparently they knew about the final confirmation before I did! I came upstairs and told Jennifer the news. We both rejoiced! I struggled to hold back tears of joy since the whole weekend was one of building excitement with this being the climax. Vance Avery Petriew, Regina, SK, reports his visual discovery of a comet during a star party at Cypress Hills, Saskatchewan, as shown below. The object’s presence was also confirmed visually by R. Huziak (0.25-m reflector) and P. Campbell (0.32-m reflector) at Cypress Hills. The observations by A. Hale were made following a request by the Central Bureau. 19.46173 5 38 01.45 +27 46 58.4 13.0 "
19.47459 5 38 05.77 +27 46 45.4 13.4 "
19.48078 5 38 07.88 +27 46 36.9 13.4 "
V. A. Petriew (Cypress Hills, SK). Round coma of diameter 3′ with condensed nucleus and no tail. 0.51-m f/5 reflector at 80×. Motion about 2′ to the southeast over an hour. Magnitude approximate. A. Hale (Cloudcroft, NM). 0.20-m Schmidt-Cassegrain reflector + CCD. Visual observations with a 0.41-m reflector on Aug. 19.47 showed a coma diameter of 2′.5 and m_1 = 11.0. There were five phone messages from the local newspaper, the Leader Post, since one of the local club members, Lorne Harasen, had alerted them to the possible discovery. I started phoning all my family, letting them know about the comet. Jennifer indicated that she would like to see the comet in the morning if it were clear, so with that in mind, we went to sleep. On Monday morning, Emily awoke around 2:30 am so at 3:00 am, Jennifer woke me up because it was clear. We packed Emily into the van and headed out to White Butte to take a look at the comet again. Jennifer wanted to see it before going to work on Monday afternoon. The telescope setup was quite easy and by 4:00 am, we had located the comet and looked at it for a while. It was difficult to pinpoint it on the star charts but I finally managed. I don’t sketch things in the eyepiece but for this occasion, I did my first sketch ever of the comet and its position. After that, we took a quick look at Jupiter and Saturn before the morning twilight started getting too bright. Emily awoke as we were taking down the telescope. We finally crawled back into bed around 5:00 am, completing the third consecutive night that I had viewed the comet. Found the comet for the third night in a row. The nucleus was visible but fainter than at Cypress in the morning sky. I thought I detected some elongation to the coma but the twilight was starting to affect the contrast. Still no tail was visible. I sketched the field and calculated its coordinates. Monday afternoon I went to work and spent most of the day answering emails from around the world and sending links to people to take a look at the first article up on the Web, posted at Sky and Telescope by Alan Dyer (www.skypub.com/news/010831.html). Monday evening, I did a photo shoot for the newspaper and answered a few phone calls. While reading my email in the evening, it clicked with me who A. Hale was on the CBAT telegram. Alan Hale, of Hale-Bopp fame, was the one who had confirmed the comet. How cool is that! I also received an email from Maik Meyer mentioning that I was eligible for the Edgar Wilson Award. Another unexpected discovery! Even though I was still excited, I managed to get some much-needed sleep. Tuesday morning got real busy in a hurry! At 6:00 am, I was awakened by a phone call from a local radio station wanting to do an interview. Apparently my picture was plastered across the front page of the local newspaper and from that point on, the word spread quickly across the country. I started receiving requests for interviews from TV and radio stations across Canada, from as far away as Newfoundland. Over the course of the next week, I did five TV interviews and approximately 30 radio interviews with the farthest one being from Newcastle, Australia. I also had numerous requests for Web site stories and pictures of the comet. Tuesday was another day of discovery since I found out that the orbital period of the comet had been calculated to be 5.5 years. This meant that the IAU could officially give the comet a name: “P/2001 Q2 (Petriew)” or “Comet Petriew” as I like to call it. Over the course of the next two weeks, I was fascinating to receive emails from people all over the world. I took the time to reply to every one of them. Email arrived from countries including Canada, Mexico, USA, Brazil, UK, Australia, Portugal, and many others. I was equally fascinated to hear people tell me what they were doing when they saw me on national television. For example, our neighbours, who were vacationing on the East coast, were just sitting down for supper when they saw me on the news. They couldn’t believe it was “the guy across the street” who had made the discovery. They were very excited and couldn’t wait to get home to talk to me. It truly was exciting to watch the story unfold in so many countries across the world, especially on the Web! Dave Chapman, from Nova Scotia, has a wonderfully informative Web site on Canadian comet discoverers (www3.ns.sympatico.ca/dave.chapman/CanCom.html). Vance, I just want to congratulate you on your wonderful discovery, even though I have found 129 comets, I can safely say I would rather trade in quite a few of those for a visual discovery. That may sound daft, but there seems to be something rather special about finding one with your own eyes! I’m also very appreciative of the number of contacts I have made with other astronomers who share that enthusiasm for the night sky. Many of the seasoned and professional astronomers mentioned how wonderful it was to see an amateur find a comet before the automated telescopes like LINEAR and NEAT. At the time of the discovery, I didn’t realize how rare amateur comet discoveries had become over the last few years but I soon learned from Maik Meyer’s Web site (www.comethunter.de). Even though the comet was not especially bright in this pass around the sun, there is a good chance that it will come close to Earth in future orbits. I’m grateful that my comet is a short-period one since most comet discoverers agree that a short-period comet is the next best thing to a big bright one like Hale-Bopp. One of the best things about the comet is the fact that I’ll be able to show it to my children and grandchildren for years to come. That makes me very happy! So what do I say when people ask my how I feel about the comet discovery? Vance Petriew, a computer consultant living in Regina, has been interested in astronomy since he was a youngster. He attended the University of Saskatchewan where he taught undergraduate astronomy labs as a student. After a short lapse, he has recently returned to astronomy and is now the president of the RASC - Regina Centre. Vance Petriew will one day write his story of the events that lead up to a new comet being discovered at the Saskatchewan Summer Star Party that now bears his name. But this article tells another story - from the viewpoint of the other guy involved with this discovery. Vance’s 20-inch Obsession scope was the hit of the observing field at the SSSP. As such, his scope was a busy place. When others weren’t bothering him, I’d step in and challenge him to a few hard-to-see objects as is often done at star parties. However, I had an ulterior motive. In the 20-inch, I was sure that most of these challenge objects weren’t a challenge at all! I really just wanted to get a good look at some of these puppies! So, in the wee hours of August 18, 2001, I challenged Vance to find the large, but diffuse, planetary nebula in Pegasus called Jones 1. I walked away to do some observing through my humble 10-inch scope in the meantime. I found and sketched Susan French’s Toadstool, the Integral Sign galaxy (UGC 3697), and the ultra-thin edge-on spiral galaxy NGC 100. Thinking Vance had had enough time to find Jones 1, at about 3:30 a.m. I walked the 40 meters back to Vance’s scope to get a glimpse. Vance, however, was looking at an object in Taurus, which he had chanced upon during an errant star-hop to M1, the Crab Nebula. He never made it to the Crab, and ended up about 1 degree ESE of beta Tauri, the upper horn of the bull. Vance stated that he had probably found a small galaxy, since he “tends to run into these things often with the 20-inch”. He was trying to identify it on the MegaStar software he had running on his laptop. A galaxy in this part of the sky seemed pretty strange to me, since this area is either covered with very thick star clouds of the Auriga Milky Way or the very dusty dark nebulae of Taurus. Thar be no galaxies in this part of the sea! I stepped up to the 20-inch, and low and behold, at the first glance, I had the answer. The object I was seeing was clearly a comet. I was certain it was. I have seen close to a hundred telescopic comets, and this one certainly did not look any different, except it was much brighter than most. I estimated its brightness at roughly 11th magnitude. My heart jumped. I could not recall any other bright comets in the sky except for LINEAR C/2001 A2, which was 180 degrees away in the Sagitta area. A few weeks ago, I had downloaded the ephemeredes for visible comets. From these, I also remembered that P/Wild 4 was somewhere in the area as well, but it was supposed to be at least 14th magnitude or fainter. “Vance - you have a comet”, I whispered. For those of you who haven’t seen telescopic comets and compared them to faint galaxies, there is a recognizable difference. Even though faint comets and galaxies can be classified as “faint fuzzies”, galaxies, no matter how faint or how fuzzy, always seem to have a definite edge, and you can always see definite dark sky beyond this edge. Comets on the other hand are not like this at all. They have extremely diffuse edges that usually meld very gradually into the background sky. They rarely have a distinct edge, and seem to spread out almost forever. Vance’s comet had a very distinct, though diffuse nucleus, and very soft and indistinct edges. A closer look also showed the comet was distinctly baby blue. I don’t know of any baby blue galaxies! It was 3:30 a.m. Although we’d been observing all night, I knew that the next few hours would not be easy ones, though they’d certainly prove to be very exciting. Vance couldn’t believe his fortune, and denial came quickly. “Surely a comet this bright must have been discovered by LINEAR or another robotic program”. He even suggested that it might be redundant to try report this object. I couldn’t believe our fortune either, but I thought it best that we should at least consider reporting it, depending on what our next hour or two turned up. And so the process started. Vance loaded and ran his latest download of the IAU ephemeredes for all known comets on his laptop. However, the last download was about 4 weeks old. Maybe the comet had been discovered since then. In the meantime, I decided that I had better sketch the field, since we were not really all that sure exactly where we were! Remember that Vance had done an incorrect starhop looking for M1 and was slightly lost! Despite a good view in the 20-inch low power field, all we had for a wide-field reference was a Telrad! I was very concerned that we’d begin a starhop back to some know star, lose our way, and maybe loose the comet in the process. So I got my sketchpad and did an accurate sketch, noting a distinct nearby asterism of stars that I was sure we could locate again, should we become lost. The sketch would also allow us to see if this object was indeed moving - proof that it was a comet. This sketch is reproduced as Figure 1. As I sketched, Vance confirmed that P/Wild 4 was indeed nearby, but about 4 degrees to the SE, with no other comets in the area. I thought for a moment that this might be P/Wild 4 if the ephemeris was wrong, and if the comet was undergoing a very bright outburst. However, an ephemeral error of 4 degrees virtually eliminated this possibility. Vance and I then found the location of the sketched asterism in both MegaStar and my Millennium Star Atlas, identifying the field once and for all. I carefully plotted the comet in the atlas, and determined that at 4:00 a.m., the potentially new comet was located at 0531.9 +2808. This done, I walked back to my scope and dug out my paper copies of the comet ephemeredes which were about 1 week newer than Vance’s copy. My search came up negative as well! In order to confirm a comet, there are a number of steps that need to be done. First, you need to rule out that it is another known comet. The last thing you want to do is waste the IAU Central Bureau for Astronomical Telegram’s (CBAT’s) time by reporting something that the whole world (except for you) seems to already know. This just makes you look like a tool! We eliminated other comets to the best of our ability. Secondly, you have to note it’s accurate discovery position. This becomes its first ephemeral point, and this we did as well. Next, we had to see if the comet was moving, and try to determine its rate and direction of motion. This is very important, since movement means it’s real (and not just a non-plotted galaxy in an atlas that may contain errors or omissions). Direction of movement also allows others to find it again. Some comets and asteroids have been lost for long periods, since the days following their discovery were plagued by foul weather and directions of travel weren’t accurately known. We knew we were up against the clock, since the sky would be getting pretty bright in about one hour! We toyed with phoning someone from the Okanogan or Vancouver Centres to follow up the observations should dawn come before confirmation of movement. This was a backup plan, even if we did not know whom we might eventually call. It was now hurry-up-and-wait time. With my sketch in hand, I returned to my 10-inch and quickly located the comet in the scope. I was surprised how easy it was to see. I also recruited Paul Campbell of the Edmonton Centre to find the comet in his 12.5-inch scope and keep a lookout for the first detectable movement. Within 15 minutes, we were both certain the comet had moved. This was wonderful, and now very exciting news. At 04:52 a.m., with the sky very bright, and only the nucleus still visible, I plotted the second position on my sketch. In the 52 minutes since my first sketch, the comet, I estimated, had moved 2 arc-minutes to the SE in position angle (PA) 135 degrees. This was less that the comet’s diameter, but enough to be certain. 5:00 a.m. and now we were getting pretty tired. Despite the adrenaline rush, it had been a very long night, and we knew we were not even close to being done. With basic information, charts and the laptop in hand, Vance drove us the 2 kilometers from the Meadows campground to the Cypress Hills Resort where a phone was available. It was important to get the report registered as soon as possible so that we were not scooped by another observer. After all, this was a very bright comet and there several other star parties that weekend! Vance knew from an earlier attempt that he could not get a reliable modem connection through the resort phone lines so we decided to telephone the report in. I knew how to do this, as should everyone, since the information is in the 2001 Observer’s Handbook on page 9. While Vance continued double checking information on the laptop, I wrote out the announcement in longhand, so that Vance would only have to read the words verbatim, and not forget to include anything. At about 6:00 a.m. we were ready. Vance dialed CBAT’s phone number and read the two-page announcement of a possible discovery of an 11th magnitude comet, 3 arc-minutes in diameter, moving at 2 arc-minutes per hour to the SE. We reported its position, description, method of other object elimination, who we were, where it was discovered and as much other relevant information we could think of. Phoning in the announcement on a weekend is not exactly the preferred method of rapid communication, but it’s all we had. Email would have been better. At 6:30 a.m., I finally got to bed. The kids woke me up at 7. Needless to say, Saturday’s daytime activities and the early evening banquet were quite a haze. I was re-presented with the RASC’s Chant Medal (which I was unable to accept at the London GA), but I was so tired that I barely remember this, or what I may have said in my somewhat rambling acceptance speech. Just as cool was Vance’s proud moment where he stood in front of the entire assembled star party to announce that he had most likely discovered a brand new comet. He had been in contact with Dan Green of CBAT via email earlier in the day, and Dan had stated that no one else had yet reported this comet! We were floored. “Comet 2001 Q2. Vance Avery Petriew, Regina, SK, reports his visual discovery of a comet during a star party at Cyprus (sic) Hills, Saskatchewan, as shown below. The object’s presence was also confirmed visually by R. Huziak (0.25-m reflector) and P. Campbell (0.32-m reflector) at Cyprus (sic) Hills...” reads CBAT Circular No. 7686 (1) on Sunday, August 19, 2001. (The next Circular (2) corrected the place to Cypress Hills and gave more astrometric data). Dan Green also appended a note reading “Congratulations! It looks like you have a confirmation”. This was indeed a very proud moment. A few post-announcement comments made me prouder of our achievement. Dan Green wanted to know who this “Rick Huziak” guy was. Vance responded by stating “Oh, he’s just the guy who was awarded the RASC’s Chant Medal” - ‘nuf said! Dan also complimented us on the accuracy of the positions reported, stating that even though they were visual, that they fit very well into the astrometric data. I am also delighted that my estimate of 2 arc-minute per hour was accurate to about 90% of the real rate and that the PA was off by only about 15 degrees - not bad for an arc so short! I was also delighted that the first astrometric measurements done on the comet were by none other than Alan Hale, of Hale-Bopp fame. As I walked back to my telescope only minutes after Vance had found that still unidentified fuzzy ball, a strange thought crossed my mind that I could have told Vance that he had indeed found a faint galaxy, and I could have relocated the object in my scope and claimed the discovery for my own - after all, I was sure it was a comet. The thought disappeared as fast as it came. It wasn’t a serious thought - just funny. (Vance and I go back a long way, to his University days when he was a member of the Saskatoon Centre. He’s now with Regina). Of course, something like this would never occur, but two strange events did happen, which point out that some discoveries are purely luck of the draw. Vance’s original target was the Crab Nebula, and he made a starhopping error that is common, starting the search at the top horn of Taurus instead of the bottom horn. Nearby beta Tauri he chanced on the comet. Exactly 24 hours beforehand, I had also placed beta Tauri in the field of my spotter to use it as a starhop starting point for a standard variable star program I do in Auriga. The comet would have been in the low power field of my main scope, and certainly was bright enough to have been seen, but I did not look in the main scope since the starhop I use is a familiar one through the spotter. 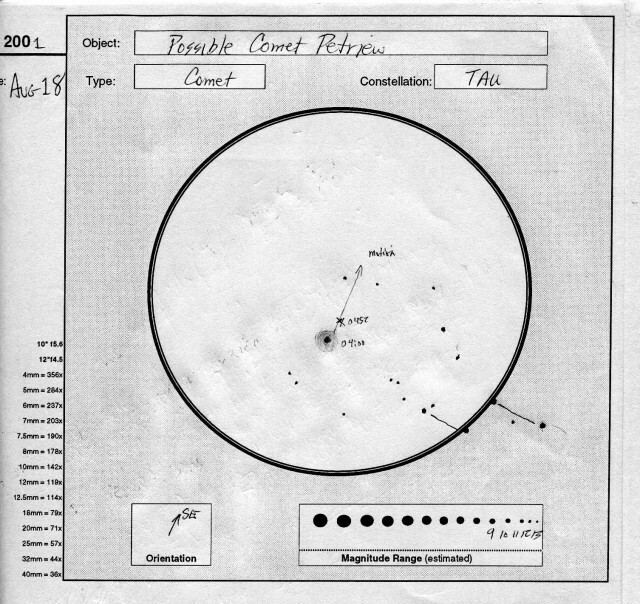 Paul Campbell, about an hour before Vance’s discovery, also began a starhop from beta Tauri, but instead of getting lost, Paul found M1, and missed out on the comet. I find it curious that the 3 of us listed on the IAU announcement all looked at the field of the comet and two of us, both very experienced observers, missed it by pure bad luck. It was just a plum cool experience! Figure 1. My discovery sketch for “Possible Comet Petriew” through the 20-inch Obsession scope.